I had counted on today being a stressful one ever since booking it. Today was the day that my PAs swapped over, at different times, on different flights, in another country. When we woke up it was dry but as soon as we had our breakfast (which wasn't the nicest but I think we have been spoilt with all the other hotels along the way!) of course the heavens opened. Set with my waterproof coat AND poncho I managed to stay relatively dry even though it was pouring down. We headed to the Museum and main shopping precinct that leads to Old Town in a light shower, but rain or not the pavements and pathways are pretty inaccessible. I knew that Prague would be difficult due to the cobbles, but what I really struggled with was that roads and paths are just not maintained well enough. 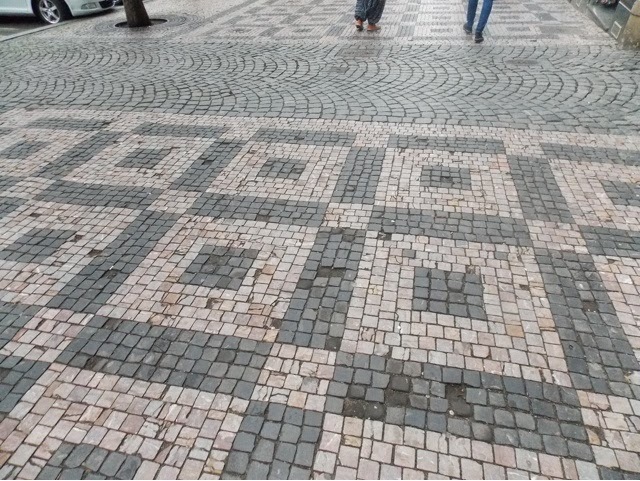 Cobbles were missing everywhere meaning that there were holes to weave around, and this was in the newer area where the 'cobbles' were 5x5cm stone blocks placed in a decorative pattern not the big cobbles that we found in Old Town. We rarely found a dropped curb and if we did, there might not have been one on the other side, so we weaved our way through the beautiful city of Prague in the rain. 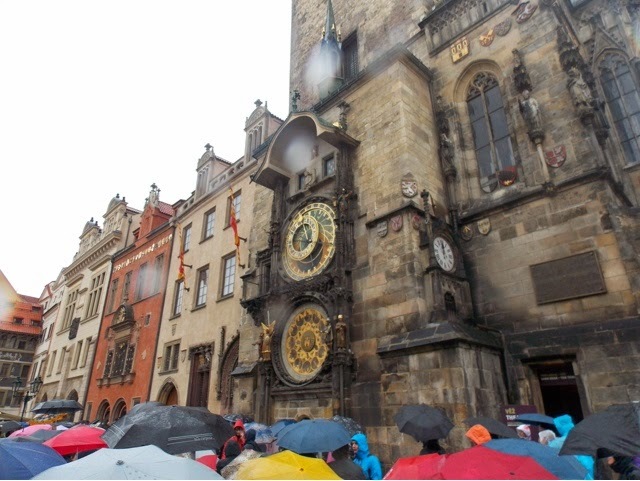 I've read so many good reviews of the astronomical clock in Old Town square and we managed to find it at 11:55am for the show to begin at 12pm. I don't want to put a dampner on this beautiful clock or turn anyone away from seeing it because the whole square is magical, but to sit for 5 minutes in heavy rain to watch a few statues heads move, a skeleton pull a bell chain and a door open was a little bit of a let down. If you're there, see it, but don't break your neck to bounce over cobbles quickly trying to get there in time for the display as the clock is beautiful without it. 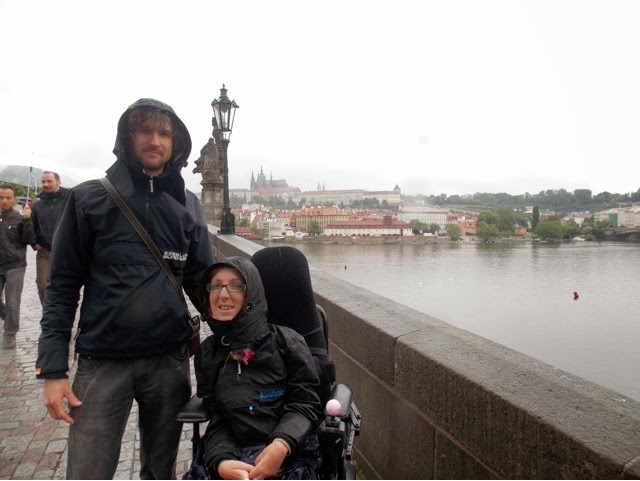 Afterwards the rain got much heavier but we powered through to see more of old town and headed towards the canal to catch a glimpse of Prague Castle. I absolutely recommend that you do not walk along the canal path in any form of wheelchair. Not only is it in the poorest of conditions (mostly damaged tarmac, sometimes refilled with sand which was everywhere) but every 50 meters you'll come across a flight of steps. It's a beautiful view so I would recommend snapping a few shots of the Charles Bridge and then walking one road in parallel to the river, equally as pretty much less bumpy. Our route bought us to the entrance of the Charles Bridge which is something you shouldn't miss during a visit to Prague. Even in the wet it was lovely and gave us great views of the castle which I believe to be highly inaccessible. There's a lovely line of tourist shops close by too which don't hold all the normal tourist tat but quality souvenirs. All of us were cold, wet and a bit miserable so we found an accessible coffee shop (of which there weren't too many) and had coffees and hot chocolates followed by the biggest slices of cake I've ever seen: it was a soft chocolate sponge with a huge layer (atleast 2 inches) of densely whipped cream that had chopped hazelnuts and whole profiteroles in, another layer of cake, dark chocolate ganache that was about an inch deep, dark chocolate shards and covered with blueberries, raspberries and hazelnuts, then the sides piped with the thick whipped cream.... Amazing!! We warned up and were ready to face the weather but it had dried up for a little while, so we were able to find our way back to the hotel easily to let my PA pack her things. Our plan was to catch the underground metro to the main station where she would catch the Airport Express bus to the airport to fly home, plus we would find out where the bus would drop my next PA off when she arrived. This turned into a mad dash as the pavements didn't have dropped curbs so I would have to drive half way along the next road and turn back to cross roads! We decided to skip the underground as we were going to be late and we could see the train station, we just couldn't get there! We walked through an accessible underpass only to find there were steps up to the other side, and a group of people shooting up in broad daylight, so my PA said her goodbyes and dashed off, giving David and I time to find an accessible route to the station on our own. We were trying to find a safe way to walk there together at night where we wouldn't bump into any shady characters as we had to collect my next PA at 10:30pm. After crossing a few roads, the train station was in sight and we found the drop off point for the airport express bus, so David and I had 6 hrs to kill in Prague before my next PA arrived. We tried to catch the underground metro back to the museum as 80% of the underground network is accessible to wheelchairs, but I'm sorry to report that it's absolutely not. A kind man gave us his spare ticket so thankfully we didn't need to pay but when we got down to the platform, there was no possible way to board the underground in an electric wheelchair. The gap was much too wide and there was a step up too, without any 'accessible' carriages at the front not rear. We ended up walking back after waiting for a few more just incase they had different style carriages. 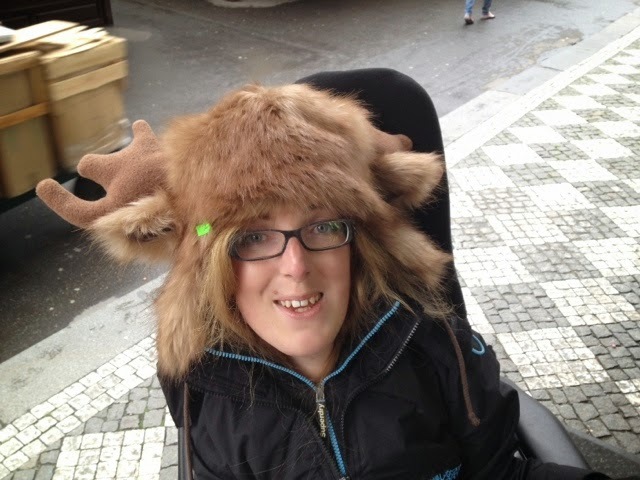 We saw a few accessible buses driving around but didn't try one out, although the trams do not appear to be accessible either! Watch out when crossing their tracks as they are a lot bumpier than the other European cities that we have visited so far. I should also mention that pedestrian crossings are timed here in Prague! Sounds like a good idea as you know how long to wait but we came across a few roads with 5 seconds to cross, which is nigh on impossible to cross in a wheelchair let alone driving carefully over cobbles and tram tracks! David and I found our way back to Old Town and wandered around enjoying the dry weather, we bought some souvenirs and I tried on an epic hat, before grabbing some food and heading back to the hotel to recharge my wheelchair in preparation for the long walk later that night.